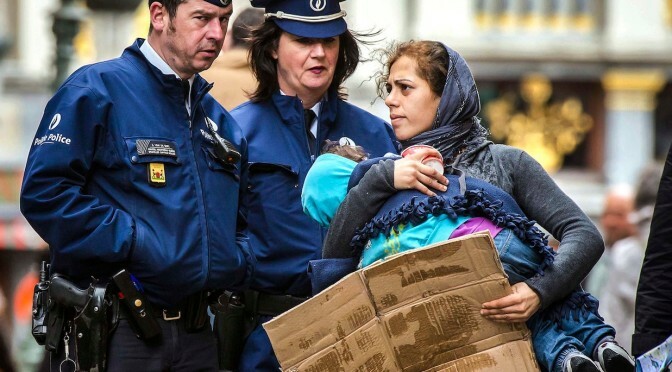 This shifty-eyed cop has every good reason to be suspicious of the camera catching the Brussels constabulary removing a woman & her child from begging in Grand Place, the central square in Brussels, Belgium. Belgium has ratified or acceded to every convention & protocol in international law concerning human rights. On paper the country looks like an international exemplar of justice. But a country doesn’t just walk away from it’s wretched colonial past by signing a few abstract & unenforceable documents. Colonialism requires a thoroughgoing historical & political accounting. Belgium & other countries are unwillling to make that accounting because it will expose their past criminalities & continuing exploitation & treacheries. That’s why finding decent history books on colonialism is so damn hard. Belgium has been cited repeatedly in the past several years for violating the human rights documents it has ratified. It’s been cited for abuses in the prison system, in particular for prisoners with mental disabilities & refugees, including children refugees; repeatedly for discrimination against Muslims, in the courts & in the public streets; housing discrimination against Travellers; forcible evictions of thousands of Roma; racist practices toward Black citizens. A picture is shaping up here of a country reproducing its colonial relations within its own borders against anyone who isn’t white. Does that explain why Grand Place is called a “white sepulchre” by Marlow, the protagonist in the 1899 novel “Heart of Darkness” by Joseph Conrad? Conrad, the Polish writer, worked for a Belgian colonial enterprise in Africa & well knew the racist depredations of European imperialism in Africa. Regrettably his experiences led him to misanthropic conclusions & his politics grew quite sour. He’s of the same generation as Mark Twain & shares the political problems of Twain, including racism & misanthropy in their senior years. They both lived in the heyday of colonialism & did not look to the colonized peoples as agents of their own emancipation. This is not the place for excuses like “they were products of their own times” since others were cogently analyzing & excoriating imperialism & colonialism. Chinua Achebe, the great Nigerian writer (most notably of “Things Fall Apart”), delivered a famous critique of “Heart of Darkness” in a 1975 lecture entitled “An Image of Africa: Racism in Conrad’s “Heart of Darkness.” Achebe was a thoroughgoing analyst of European colonialism & called Conrad a “thoroughgoing racist.” This offended quite a few & stirred up quite a literary & political controversy–in precisely the same way as criticisms of “Huckleberry Finn” by Mark Twain. The pending US intervention into Nigeria requires that historical accounting & puts colonialism, neoliberalism, & racist, xenophobic practices under the glare of exposure. It is important that we listen less to the voices of racist historians & writers & more to the voices of Africa. No US intervention in Nigeria!